For my Unity Friends with Flair Entry this week, I made another mini journal page from my Faber-Castell Design Memory Craft Mini Journal. I created a brayered background using my PaperArtsy Fresco Paints in Slate, Turquoise and White. Then, I stamped a Unity Susan Weckesser background stamp on left side in Watering Can Archival Ink. The flow r is from the new Unity Lazy Daisy set and the sentiment is from Unity Donna Downey Empowered Words. The flower was stamped in Leaf Green and Red Geranium Archival Inks and the sentiment was stamped in Versafine Black. After I stamped the red flower I stamped it a few times over the background stamp to add a little color to he other side of the page. Then I inked the edges of the page with the Red Geranium Archival Ink and smudged the edges with my fingers. To make the flower stand out more, I outlined it with a Faber Castell Pitt Pen. To finish it off I sprayed it a few times with Dylusions White Spray ink and I put my finger in the Red Geranium Ink and smeared some of the red color around the page. I love how fun it is to make the quick page in this mini journal. It makes it easy to experiment with new techniques. Thanks for stopping by! Very Nice page. Will Love to see the rest. Gorgeous journal page! I am really thinking about making a journal of my own now! This is yet another wonderful page! You must have a super gorgeous album by now and I love how you finished it by smudging the edges and outlining the flower, it really stands out! So, so pretty! Love everything about this! Awesome page! The colors are wonderful. I love this the colours are gorgeous. Such pretty colours and great texture! 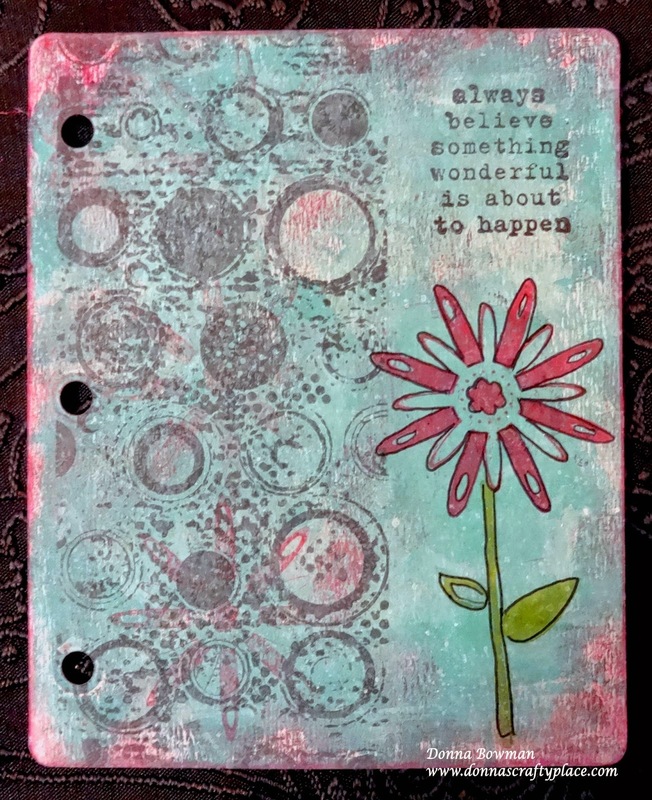 This is a really pretty journal page, I love your color and stamp choice. Love that awesome saying. Beautiful piece Donna. Oh my, this is simply stunning, love the colors and stamps. What a great little page. That is the perfect size for most stamps. Great sentiment and background for this flower. Beautiful!!! Love this sentiment. What a terrific little mini page!! I spotted your card at Unity FWF and came over for a closer look. Thanks for sharing your beautiful journal page. Great page! Love all you did with it.